When Hells Headbangers re-released Danish Witch Cross Fit for Fight towards the end of last year, it was a big fat hint that the move is afoot for the Danes to reunite and have an album to be released after an almost 30 year pause. No less … It is rare, and right off the top of my head I can’t even think of a case, where a band comes out, releases an album considered pretty much cult among genre’s aficionados, only to fade into the background for 30 years until the next album in their discography. And to think of it, a pair of musicians currently in the band was involved with Fit for Fight. So, where were these dudes all these years? 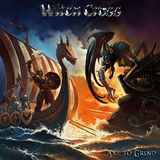 Whatever the answer is to the question above, 2013 version of Witch Cross maintains allegiance to straightforward classic heavy metal. The emphasis these days is even more on straightforward, as funky idiosyncrasies from Fit for Fight are no longer present. If there was an encyclopedia definition of easy-to-get-into album, then Axe to Grind should have its cover art as a prime example posted in that tome. And if you are into 80s metal, then it would be easy for you to like this album as well. Sure enough, the riffs for these songs are definitely a little bit of stock variety, but classic slightly cantankerous guitar tone (courtesy of names like Chris Tsangarides and Flemming Rasmussen), quality guitar solos and sheer catchiness of these songs will win you over in a second. Just about every song on the album contains a bridge where hooks are plunged deep into flesh. New vocalist Kevin Moore has a tendency to harmonize in those moments extracting almost karaoke sing-along moments. Speaking of the vocals, Kevin Moore does not have the outwardly vocal climbs of Alex Madsen, the band’s old vocalist, but he is more than capable holding his own, reminding me tremendously of Biff Byford’s style and enunciation. That, and straightforward biker tunes like Ride with the Wind will have you thinking Saxon when listening to Axe to Grind a lot. The first half of the album is full of these in your face simple tunes, with Demon in the Mirror and anthem stadium crowd riser Metal Nation leading the way. Mid-way, after rolling true metal title track instrumental, Witch Cross tries to get a bit more experimental. Bird of Prey sees a female vocal intro (Doro would have been fantastic to guest here). This song, as well as somewhat atmospheric Awakening/Pandora’s Box, has some interesting vocal layerings. Part of the Machine is heavier, and a little creepier, a slight nod towards late 80s Black Sabbath and modern day Trouble. The Killing of Chelsea 100 is probably the weirdest song on the album combining stoner rock and choppy gallops, but the simpler direct material is more of a winner here on the album. Not meant to be a repeat of Fit for Fight, if the NWOBHM cultists are following this review, Axe to Grind is an album of old dudes still being able to have fun with their favorite music when they are probably in their 50s. Another seven years and I will be there myself, so I am glad to see fun is still a possible and operative word when you begin entering your golden years.